As a few of you may know, I work in the anesthesia recovery room at my local hospital as a Perioperative Care Assistant (aka – an aide). I’ve been in my position for a year and a half, and have decided I’m ready for a change and to learn some new skills. I am transferring to the ICCU in a couple weeks. It’s an exciting and nerve-racking time all at once. However, it means SHOPPING. I’ve worn surgical green scrubs my entire hospital career, but in ICCU I will need to wear my own scrubs, in other colors. I am lucky enough to have 2 amazing friends who have donated their old scrubs to the cause. This saved me a TON of money, because scrubs are expensive. Go ahead, google them. It’s ridiculous. On top of their “donations” I also purchased a pair of pants from a local scrub store, and then 3 tops from eBay. I forgot all about eBay for years, but this has opened up all new doors for me. As a present for myself, a sort of celebration if you will.. I bought myself some new shoes for work! I love sneakers, and love an excuse to buy new ones. So these are what I got! I figured the grey will be a good neutral to go with any color scrubs I wear, and the teal is a little special touch, but won’t necessarily clash with any color either. 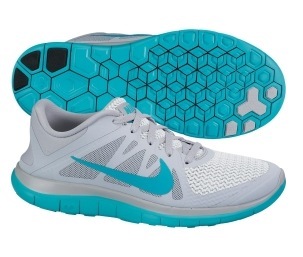 They are the Nike Women’s Free 4.0 in Grey and Turbo Green. I can’t wait to wear these! On another note, while shopping I also picked up more hangers, so I can hang up all my scrubs and keep them from getting wrinkled, as well as a new laundry basket because mine was looking ratchet. What do you use as an excuse to buy new stuff? Anyone have any scrub brand recommendations? Colors or patterns?